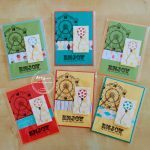 You may have seen my Facebook posts with photos of my swaps from the two events I attended in Salt Lake City – OnStage Live and the first Stampin’ Spectacular hosted by My Pink Stamper. Here they are again. Let me tell you a little bit more about them! For OnStage Live I made Christmas themed swaps, and these were card fronts only. One set features Hearts Come Home and the other features Sugarplum Dreams, and I can’t decide which is my favourite. 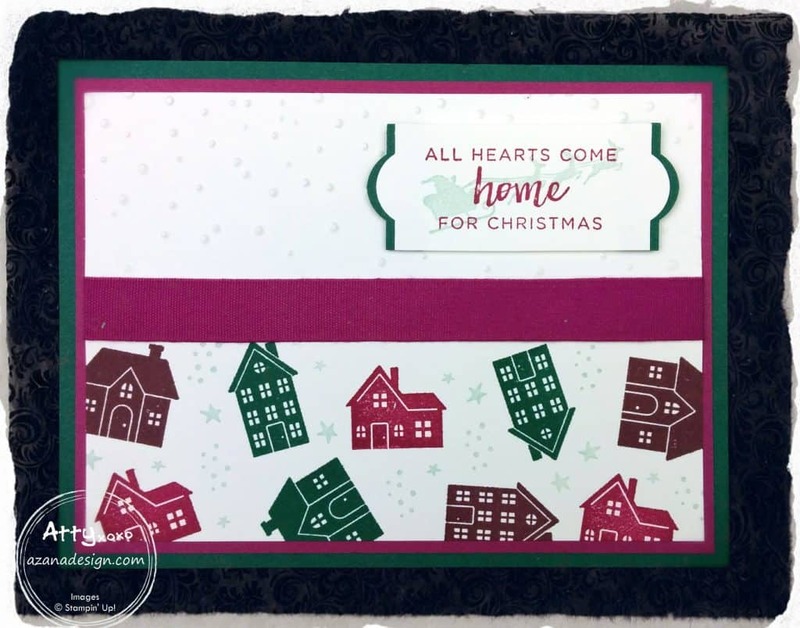 The Hearts Come Home card is a great little design and only uses the one stamp set. 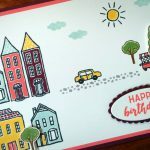 There are three house images in the stamp set and these are stamped randomly along the bottom of the cardstock in different coloured inks. I used a few of the new InColors: Fresh Fig, Tranquil Tide and Berry Burst. For those who know me well, it’s very hard for me to do random! Scattered amongst the houses I randomly stamped two different sized stars and a little pile of snow in Soft Sky. 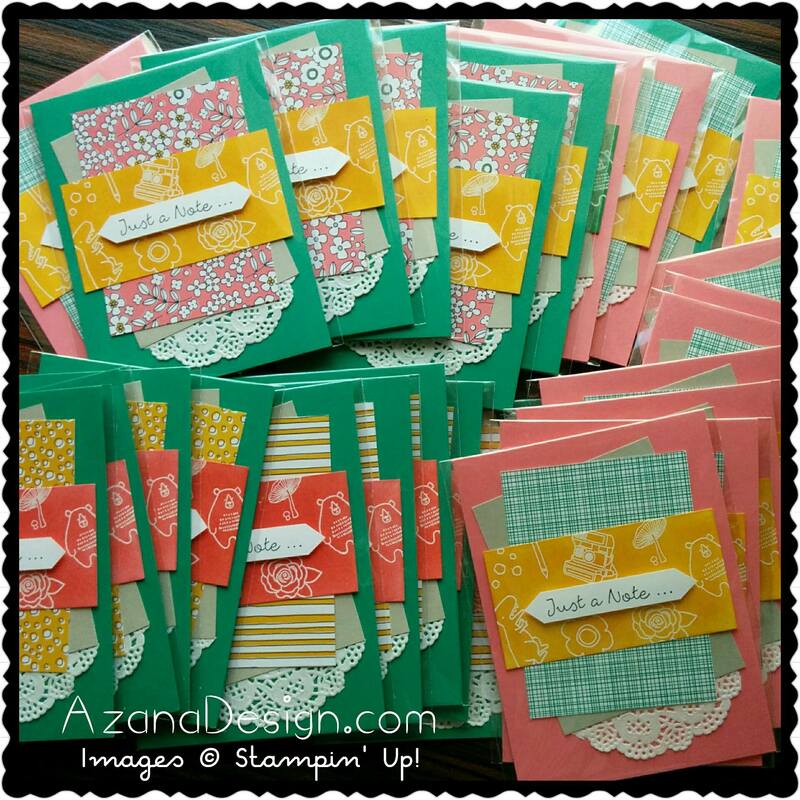 The top part of the cardstock was run through the Big Shot using the Softly Falling embossing folder. 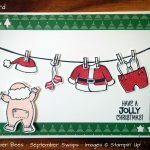 The sentiment has Santa and his reindeer stamped in Soft Sky behind it and is punched out using the Everyday Label punch, which has been trimmed along the top and the bottom. 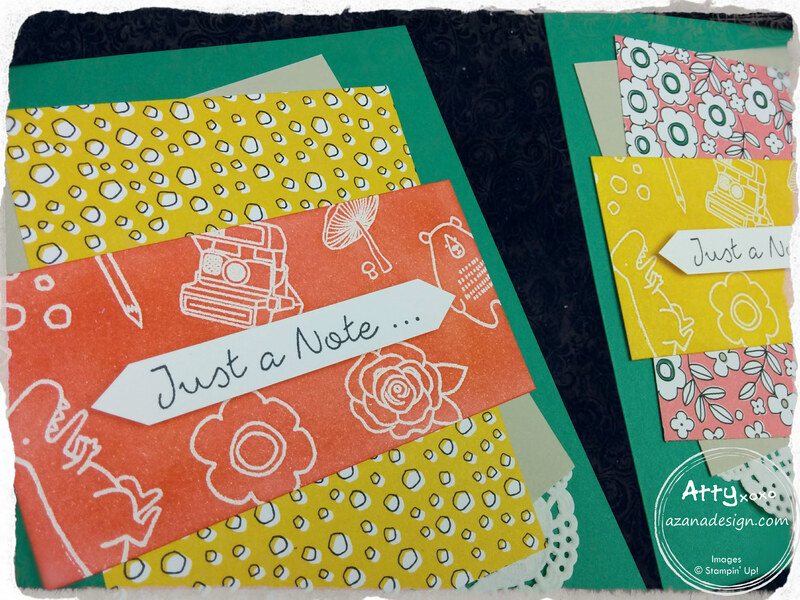 This has been shadowed with a Tranquil Tide cardstock layer punched out with the same punch. I’ve used some Finely Woven Ribbon to hide the join between the embossed part and the stamped part of the top layer. My second set of swaps for OnStage Live started off as a simple idea but when you’re making 40, simple seems to take a long time! 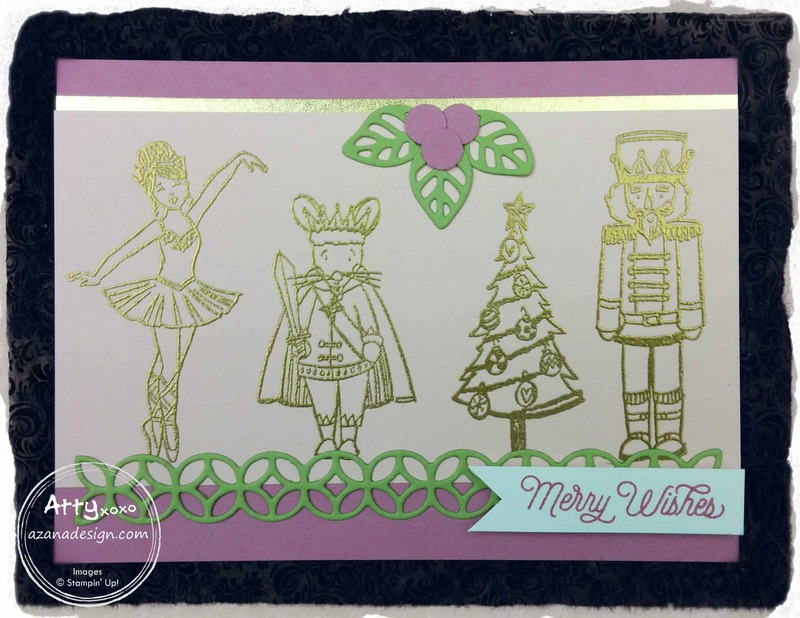 I have heat embossed the four characters from the Sugarplum Dreams stamp set in gold (or silver) onto Powder Pink cardstock. I put a strip of gold (or silver) washi tape from the Year of Cheer Specialty Washi Tape set (love this stuff!!) along the top of the card front base (Sweet Sugarplum for the gold and Wisteria Wonder for the silver). The embossed layer is then decorated with a strip of “lace” in Pear Pizzazz from the Flourish Thinlits and the leaves of the holly were also from this Thinlits set. The berries were punched out from the Cookie Cutter Builder Punch. The little Merry Wishes sentiment is from the Oh! 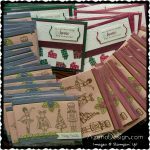 What Fun stamp set. This card really does look very shimmery under the light and I really love how it came together. When I think back over swaps I’ve made en-mass for various events, somehow most of them feature heat embossing. I do admit I love heat embossing – watching the powder melt and become glossy. 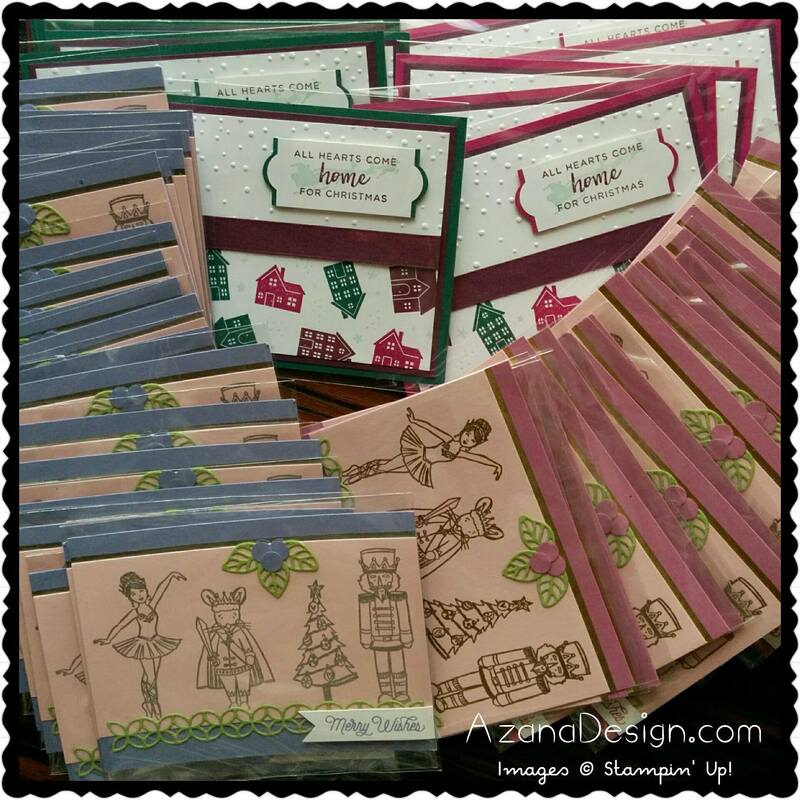 My swaps for the Stampin’ Spectacular also featured heat embossing – white powder onto Shimmery White cardstock. My intention was to watercolour the cardstock so the images would emboss resist, but I didn’t like the way it turned out as the colour wasn’t intense enough, so I ended up sponging the colour on and liked the result much better. I do love all the varied little images in the Pieces & Patterns stamp set but the t-rex is definitely my favourite. This card is quite simple and layers some Pick a Pattern DSP onto Sahara Sand cardstock, with a bit of Delicate White Doilies for some texture. This is another “me attempting to be random” card – layers don’t always have to be straight – and I’m happy with the way it turned out.